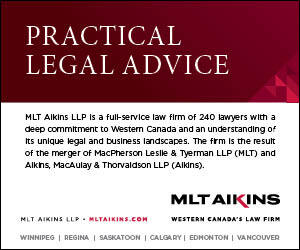 MLT Aikins LLP is a full-service law firm of more than 240 lawyers with a deep commitment to Western Canada and an understanding of this market’s unique legal, political and business landscapes. Based out of six key centres across the four western provinces, MLT Aikins is the only law firm to have offices in Winnipeg, Regina, Saskatoon, Calgary, Edmonton and Vancouver. As one of the 30 Largest Law Firms in Canada (Lexpert, American Lawyer Media), we have the bench strength and geographic scope to meet the increasingly complex needs of clients – from the personal concerns of individuals to the highly sophisticated and comprehensive requirements of major business enterprises. MLT Aikins is the result of the merger of two widely respected and distinguished law firms, MacPherson Leslie & Tyerman LLP (MLT) and Aikins, MacAulay & Thorvaldson LLP (Aikins).